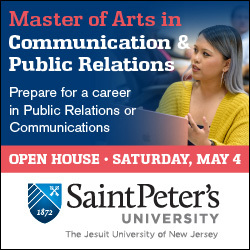 ← Calling All PRSSA Members: Are you PRSA NJ’s 2014 Future PR Professional of the Year? Registration deadline is March 28! Morning workshop spent reviewing KSAs. 12:30–1:30 p.m. EDT Lunch — attendees on their own. Preparation time for those attendees putting finishing touches on assembling their portfolios. Readiness Reviews will take place as scheduled. Attendees should already have been advanced from Readiness Review. Class for KSAs in preparation for the computer-based Examination. Continuation of class for KSAs in preparation for the computer-based Examination. Lunch — attendees on their own. 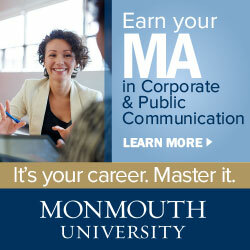 For further details, go to http://www.prsa.org/Learning/Calendar/details/6151/APR_Boot_Camp. A Great Way to Promote Your Business! 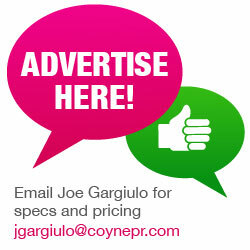 A sponsorship with PRSA NJ helps get YOUR company noticed! Make networking contacts and help your business grow. 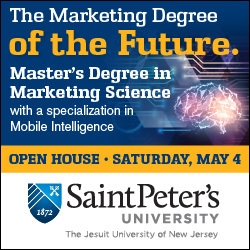 Contact us today to find out more about this great opportunity. 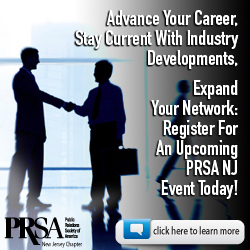 Sign up for the PRSA-NJ newsletter! ©2019 PRSA NJ. All Rights Reserved.